Being Flat-Fee, Full-Service agents is so rewarding when you have an opportunity to help a family save money selling their home. Mike and I have have know this family for a while now. 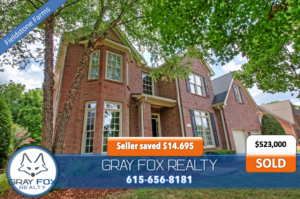 When they decided to sell one of their investment properties in Fieldstone Farms they called Gray Fox Realty. As a result of the Gray Fox Realty Full-Service, Flat-Fee system this family saved $14,695 in commission dollars that otherwise would have been paid to a real estate brokerage. Now that’s what Gray Fox Realty calls: helping someone “keep the equity”. If you are interested in learning how you can save thousands selling your home click here and Mike or I will get in touch with you to set up your in-home consult. We can help you sell and find your next home. Start your search now. Find me a home.